Former Major League Baseball executive Bill Geivett is passing along his wealth of knowledge on the sport, in the form of a new book, Do You Want to Work in Baseball? This book is a guide that will direct a person through the process of acquiring a job in professional baseball. Geivett began his baseball career as a player in the California Angels minor league system, until a knee injury knocked him out of the game in 1988. After retiring as a player, Geivett coached at Loyola Marymount and Long Beach State, before becoming a scout with the New York Yankees in 1991.From there, Geivett rose the ladder of baseball success to eventually becoming the director of Major League Operations for the Colorado Rockies. He, along with Rockies General Manager Dan O’Dowd, resigned from the Rockies in October 2014.Geivett has turned his attention to writing and consulting with various sports teams and businesses. I spoke with long-time friend Geivett, on the phone recently and we discussed his book.JB: This is not just a simple “here’s what I did” 150-page book. This book has over 300 pages of nuts and bolts, systematic processes on how to get hired in professional baseball. How long did you take to write this and why so detailed?BG: It took me about a year and half between writing and editing. That book is about 89,000 words, when I first went to the editor with it, I had about 150,000 words. They told me I should have two books, but I didn’t like the idea of two books. There are a lot of statistical analysis students out there, but they don’t have the baseball background. So, I wanted to help them to present their knowledge to a potential employer while still being able to relate to the on-field baseball knowledge. I wanted the book to cover both sides of the business.JB: Do you wish there was such a book when you got started in the business? BG: I think it would have been very helpful. This book is really written by a lot of people. I’ve organized the information that I learned over the course of my career and put it all together. There’s a lot of books that tell stories, but as far as the mechanics and technical aspects, there’s not a lot of books that really do that. So, I had to put it in a way that people would want to read it and not feel intimidated by the length. I want them to be able to read it and gain some knowledge. JB: For a career in sports as an athlete you have to be born with the physical ability to perform that sport at a high level, but when it comes to working in the front office, these skills can be taught. Isn’t that right? BG: No doubt, but you have to have a base of knowledge in today’s world in terms of statistical analysis, and that’s the plus you’re looking for. You have to have tangible evidence. You can, I would say, conform your knowledge to how they like to look at things, and what the pervading thought is in the front office now. You get to tailor your skills to be able to adapt to the way they like to do things, and that’s the biggest part. People are going to get a job [in baseball] because somebody feels like they’re a prospect that can come in and be able to do the job eventually. They don’t look at anybody as being hired for their first job as a baseball savior. They want them to be able to contribute right away, and to be able to contribute right away it’s going to be through the statistical analysis type of positions. JB: Have we got to a point where baseball has taken out so much of the subjective aspect of evaluating talent, and are now relying heavily on computer programs and analysis? BG: I don’t think so, I think it’s just adding to it. That’s where people to me misunderstand what’s going on. All of this is just adding to more information to help make decisions, where some people might feel intimidated by it, because they don’t understand it, so they are almost in a defensive posture instead of using it as more information to make decisions. JB: This is a textbook for young people who would like a career in baseball, but it’s also written in a way that baseball fans of any age can get a better understanding of how the business of baseball operates. What kind of feedback have you received from those who have read the book? BG: The feedback has been great, even on Amazon. I’ve been overwhelmed and humbled. Students have been great because they tell me they just don’t learn this type of stuff in their course work in college. One guy said, ‘we’ve had workshops but they never really explained some of this stuff.’ Baseball fans have been really happy with it because they never really understood about scouting. They just thought a guy wore a fishing hat, watched games, and some how he could tell through his Magic 8-Ball if a guy could play or not, just by looking at him. But, there’s a really an intricate process involved to figure out if this guy could play at the Major League level. JB: Who influenced you in your transition from player to scouting to front office? BG: I left coaching at Long Beach State and took a pay cut to become a scout with the Yankees, because I wanted to be around pro baseball. That’s where I met Bill Livesey, the Yankees scouting director at the time, and without him I don’t think I would have had any of the jobs I had or be able to write a book about it. After leaving the Yankees and going to Montreal to be their farm [minor league] director, my first front office position, I worked with Expos manager Felipe Alou. Those two guys really set the foundation for me; Felipe in terms of the Major League level and on the field, Bill Livesey with scouting and player development. I don’t know how anybody can get any better than those two, and they’re both really good teachers, too. JB: Many of us here in Tulsa got to know you during your days as assistant general manager for the Colorado Rockies, when the Rockies were the parent-cub of the Tulsa Drillers. What was that time in your career like for you? BG: It was great, I’ve always loved Tulsa. The late Went Hubbard, former Drillers owner, was great to me. That made it even better, knowing I was going to a city where I really love the people there. I played in the Texas League a long time ago, but as a player I never really got a feel for the city or how much the city loved the Drillers and the history of the team, until I got a front office position with the Rockies. As someone who has worked in minor league baseball practically all my life, since I was a batboy for the Jamestown Expos, I can tell you I wish I had read this book 30 years ago. 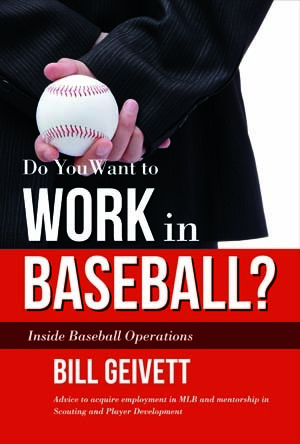 Geivett’s book, Do You Want to Work in Baseball? is available on amazon.com and at his web site; www.insidebaseballoperations.com.